The Comet Mill represents a rare example from the later nineteenth century of a large sawmill and associated settlement. It operated from 1884 till 1902, and was connected by an outlet tramway to the railhead at Wandong. The mill was regarded in its day as the largest hardwood sawmill in Australia, processing up to 800 logs per month. The mill includes remarkably well preserved features in view of its advanced age, including concrete machinery foundations, intact earthworks and smaller fittings. 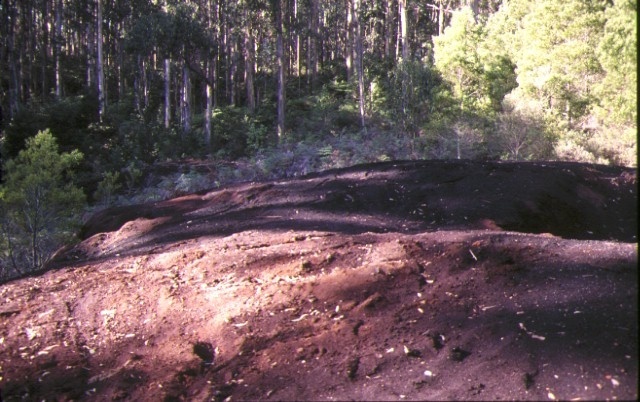 The large sawdust heaps demonstrate the scale of milling operations, while large scatters of domestic debris indicate the extent of settlement at the site. The Comet Mill is of historical and archaeological significance to the State of Victoria. The Comet Mill is historically important as one of the earliest sawmills in Victoria to be run by a large company rather than as a family business. It was relatively long lived, and supported an important mill settlement. The company was also one of the earliest to attempt to kiln season Australian hardwoods. The Comet Mill is archaeologically important for its potential to yield evidence which will be able to provide significant information about the technological history of sawmilling, and the cultural history of sawmilling settlements. Comet Mill, Mount Disappointment, Mitchell Shire. 1. All of the Crown land including machinery foundations, earthworks, sawdust heaps, settlement debris, surface artefacts and any other remains of sawmilling and associated residential activity within a 200 metre radius of the point with Australian Map Grid co-ordinates E374 N626 on 1:25,000 Map Sheet No 7923-3-1 Reedy Creek.